Diabetes needs neither introductions nor any descriptions. It is one of the most common diseases around the world. Diabetes is such a disease that not only brings changes in our body, but also to our lifestyle as well. In fact, to tackle diabetes and lead a healthy life some life style changes are very essential. The most important one is in our food. Diabetes patients not only should not miss any of their food, but also make sure that their food is healthy and would not affect their blood sugar levels. So as a diabetic patient, breakfast is a must and it can have real benefits. Here some suggestions for tasty and healthy breakfast for diabetic patients. For a meal in a minute, blend one cup of fat-free milk or plain nonfat yogurt with one-half cup of fruit, such as strawberries, bananas, or blueberries. Add one teaspoon of wheat germ, a teaspoon of nuts, and ice and blend for a tasty, filling, and healthy breakfast. Cut a bran muffin or other high fiber muffin into half then cover the sides with berries and top with a dollop of low or nonfat yoghurt. You have yourself a fast, easy and healthy breakfast. A breakfast with the right cereal in right amount is a healthy breakfast. Prepare a bowl of high fiber, low sugar cereal with skim milk or heat up plain oatmeal. Be sure to measure the one serving size to keep the portion size in check. Limit the amount of butter and sugar used. Instead of these, top with fresh fruit, skim milk, or a sugar substitute to sweeten the meal. One of the healthiest diabetes breakfasts is the traditional scrambled eggs with toast. If it is cooked right, it can be a healthy way to start the day. Scramble the egg in a non stick pan with a cooking spray. Serve this with a slice of whole wheat toast topped with a light butter substitute, low fat cream cheese or sugar free jam. Using a non stick skillet and cooking spray, scramble an egg with onions, green peppers or spinach. 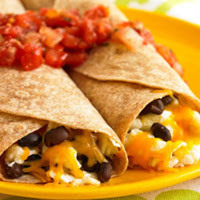 Place in a warmed whole-wheat tortilla, sprinkle with nonfat cheddar cheese, add some salsa, and you have a healthy breakfast to keep you going until lunch. This easy meal can be eaten on the go when wrapped in a foil. Use bagel thins for your breakfast instead of bagels, as bagels are very large and you may start your day overloading on carbohydrates. Top the bagel thins with peanut or almond butter for a dose of healthy fat and proteins that will keep carbohydrates in check. For a breakfast you can eat on the run, grab a healthy handful of whole, raw almonds and a small serving of low glycemic-index fruit, such as berries, a peach, an apple, or an orange. The fiber and healthy monounsaturated fats in the nuts will help you feel full, and the fruit adds additional fiber and a touch of sweetness to your morning without causing a blood-sugar spike. Here are some tips for preparing a healthy diabetes breakfast. Keep the diabetes dietary goals in mind, which involve eating more grains, beans, and non-starchy vegetables than any other type of foods. The diabetes food pyramid also sanctions few fats, sweets, and alcohol. In between and equally divided are meat and protein, starchy vegetables, fruit, and milk and other dairy products. Cook with less fat by using nonstick pans and cooking sprays and heart-healthy butter substitutes. Choose lean meats, such as Canadian bacon, turkey bacon, or turkey sausage. Eat low-fat dairy foods, such as non-fat or one percent milk, low-fat or fat-free yogurt, and low-fat cheeses. Avoid fat- and sugar-laden coffee drinks. Drink regular coffee and use 2 percent milk and a sugar substitute.